I told you a few weeks ago that Sausage Rolls are a mandatory holiday tradition in our family. I grew up with pork sausage wrapped in pie crust, but I have seen many versions with puff pastry…..it was time to investigate….. 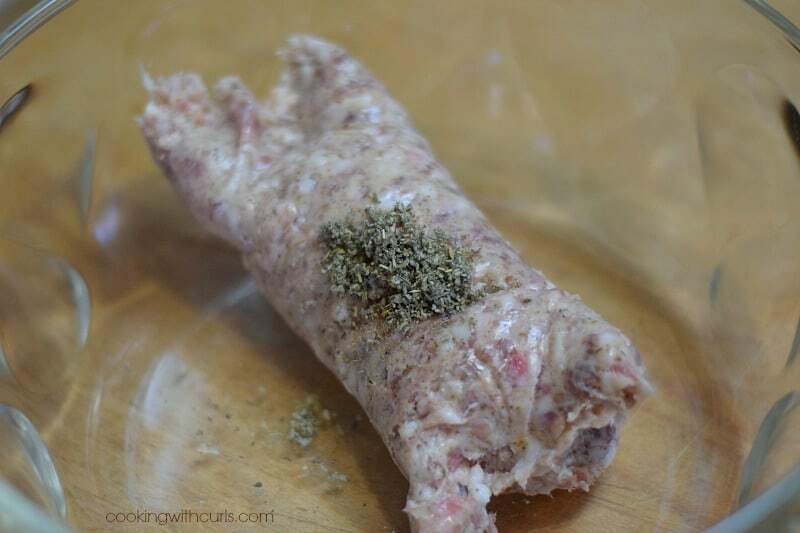 Mix MSG free organic pork sausage with ground sage…..
that is one of my mom’s little tricks to give it more flavor. I had already tried this sausage in the past, and knew that it was pretty bland so this was the perfect solution. 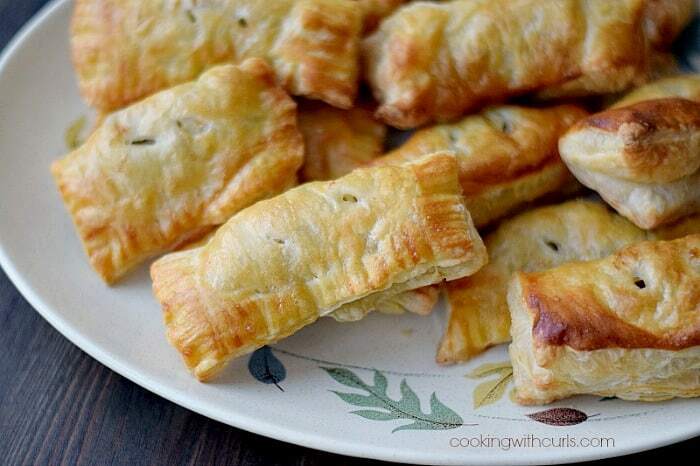 I defrosted a box of puff pastry, rolled it to even it out, and cut it into squares….. Warning – do not leave your puff pastry on the counter to defrost, it will defrost too much and become sticky and difficult to unfold! Do not worry, it’s dough and can be smooshed into place if necessary. 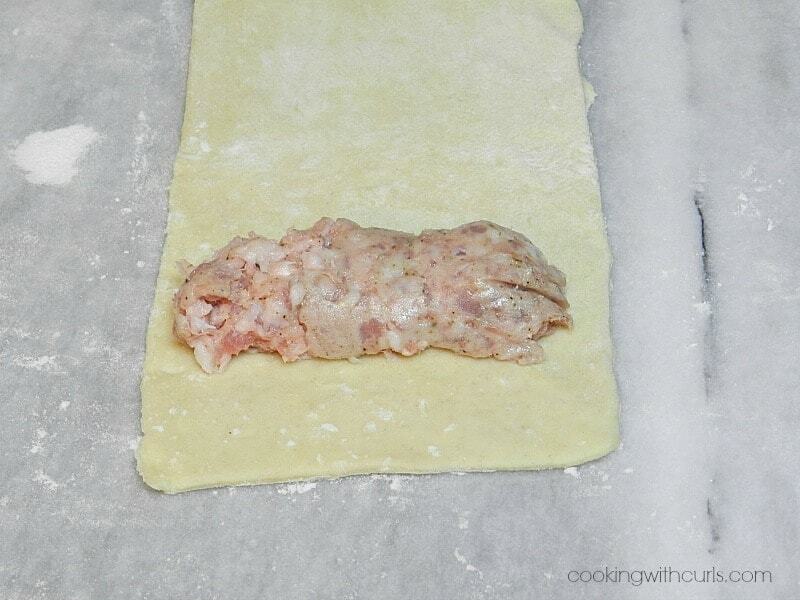 Place sausage in the center of each square…..
then fold over and press edges together to seal….. The smaller sized rolls are the perfect size for appetizers, the larger ones are perfect for a holiday breakfast. Slash the top of the pastry so the heat can escape, give them a quick brush with egg wash and then bake….. The big difference between the Pork Sausage Rolls and the Turkey Sausage Rolls, is the amount of grease that the pork sausage produces. As soon as they come out of the oven, I transfer them to a cooking rack to allow them to drain….. I decided to crimp the edges with a fork on half of them. They looked kind of cool, but they did not puff up as much…..
No matter how they look, they are quite addictive! Leaner pork sausage will not produce as much grease as mine did. 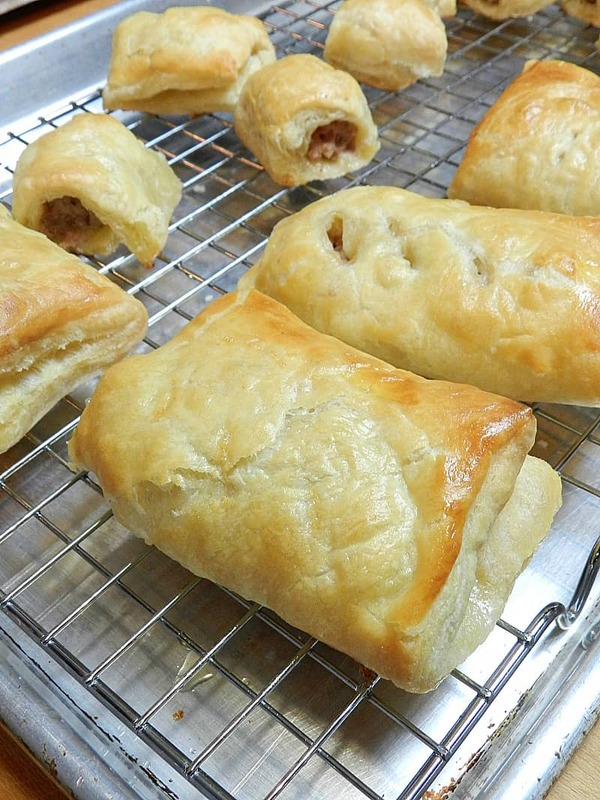 This was the first time that I had made sausage rolls with puff pastry, I usually use pie crust dough which is quite delicious as well I might add!! I now have an amazing sausage roll recipe listed below with even more flavor that you should try as well. 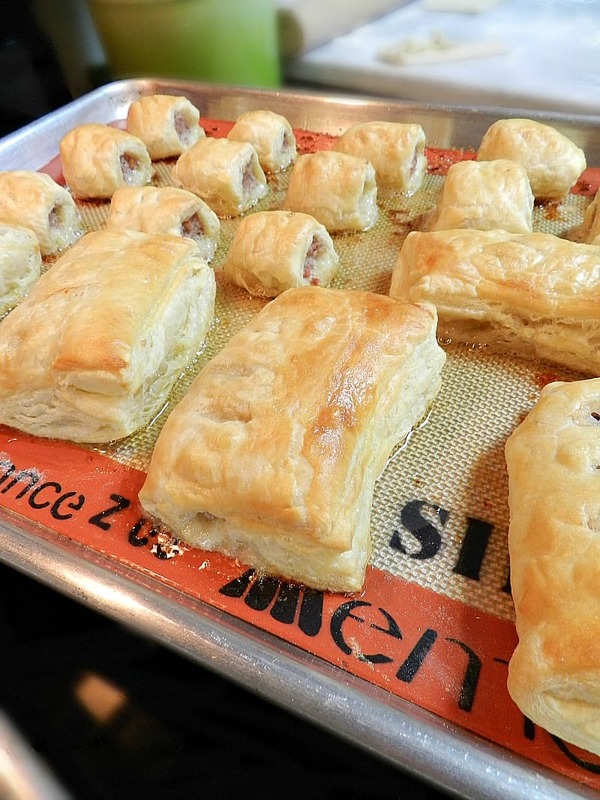 Sausage Rolls wrapped in puff pastry are a family tradition that never gets old! Preheat oven to 425 degrees. Line two baking sheets with parchment paper, set aside. Mix sausage with ground sage. Set aside. 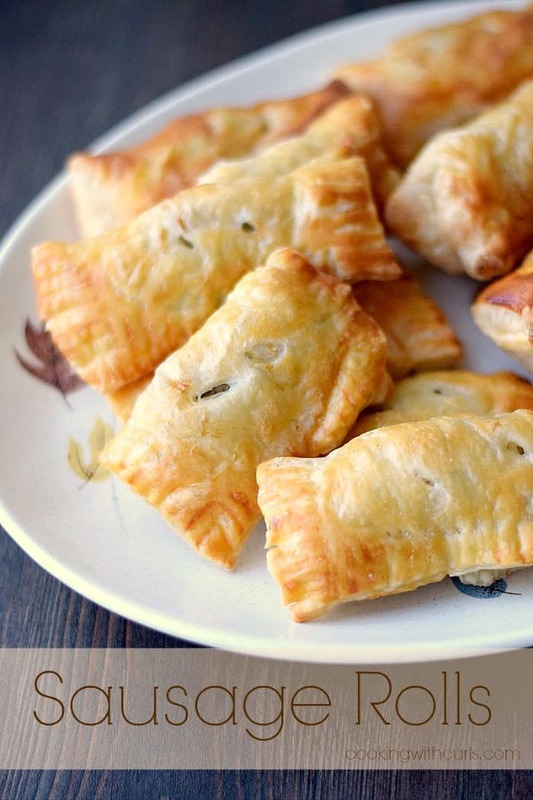 Roll out puff pastry to even out creases. 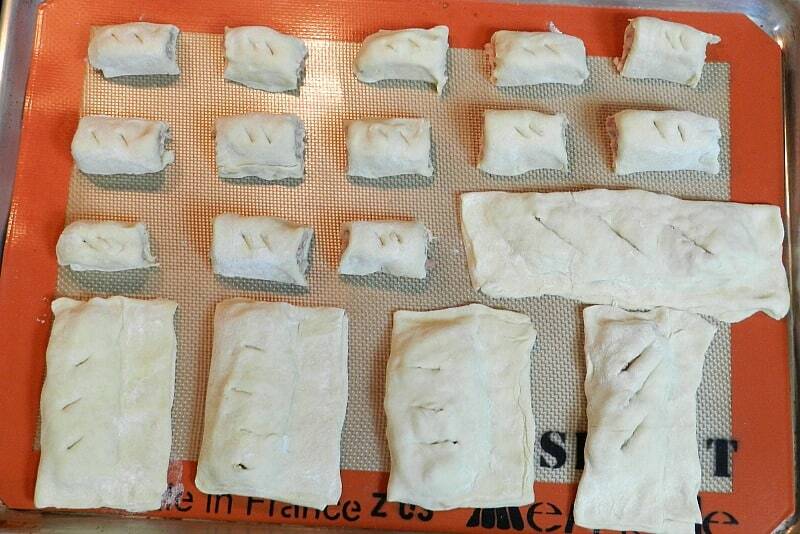 Cut pastry along the creases, (you can still see them) then again in the opposite direction to form squares. Place 1 - 2 Tablespoons of sausage in the center of each square, depending on the size of your squares. 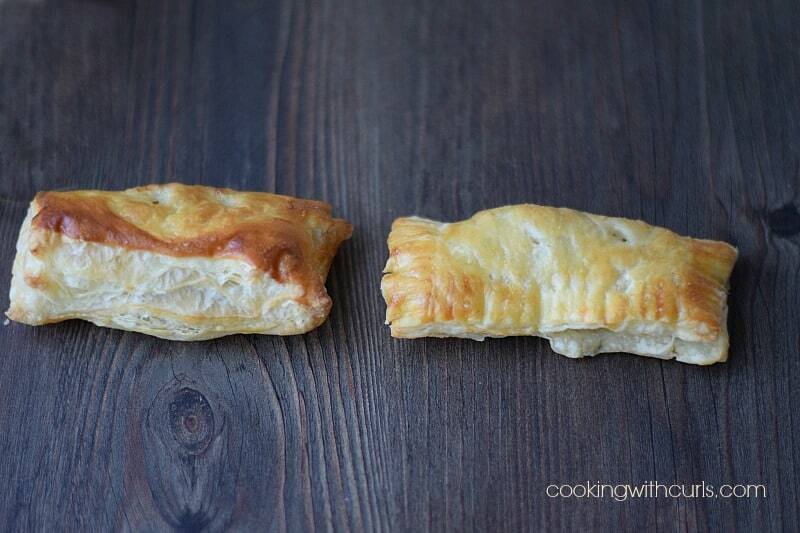 Fold pastry over sausage and press edges together. Brush with egg wash and cut slits in the top of the pastry to vent. Bake for 15 minutes, or until pastry is puffed and golden brown. 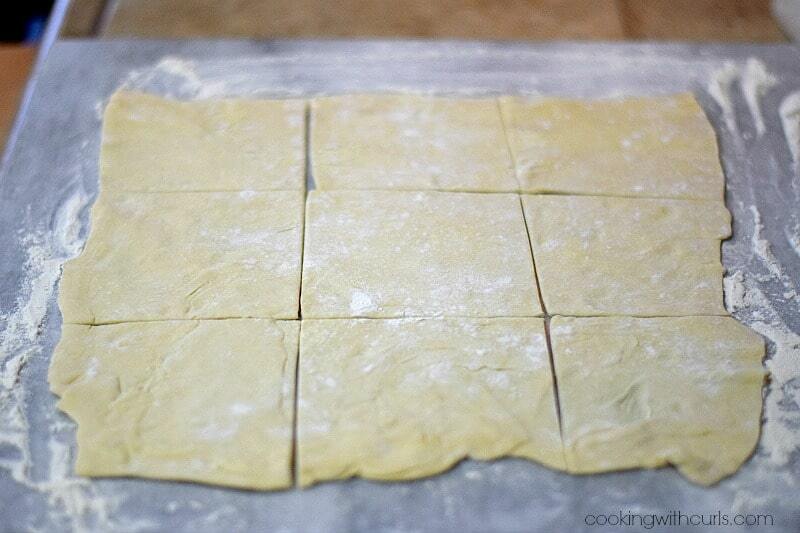 You can double the amount of servings, by cutting the pastry strips in half. 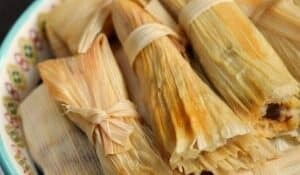 Love how easy these are to make and how delicious they look!! Lisa, these sausage rolls sound and look absolutely delicious and I can just imagine how addictive they are! My hubby is a the sausage king and he would love these!!! Thank you so much for sharing your recipe – pinning and sharing! Hope you are enjoying the holiday, my friend! Can’t believe 2014 is almost here! These are so fluffy. I might make these tonight for some easy warming Sunday morning. Thanks for sharing. I’m pretty sure I could eat about 50 of those little rolls. 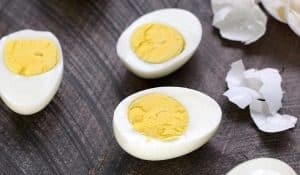 🙂 Thanks for sharing this recipe, looks and sounds great. I love sausage with puff pastry, these make me hungry, Lisa! I’ve been looking for something to take to a New Year’s Eve Party and this just might be it!! Though sausage in pie crust sounds good too! So glad you linked it up to Saturday Dishes. Well done with the investigation Sherlock! Seriously, these look delicious and I know John would love for me to make these… thanks for sharing at MM and pinning! I. Love. Sage. I still haven’t made this. Is it okay to make them even if NYE is over?? These look delicious Lisa!! And great photo too! A co-worker of mine use to make something similar to this. LOVED IT! I use to ask for her to bring them in all the time. 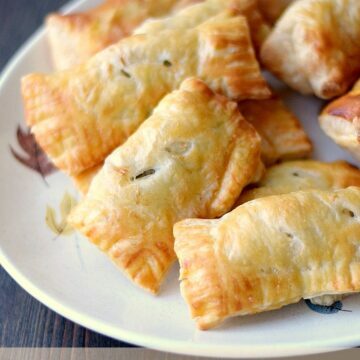 These sound amazing, love the tip on defrosting the puff pastry. I have never used it before so very useful! Pinning! So I did make these for New Years and they turned out great! Thanks for linking it up to Saturday Dishes. 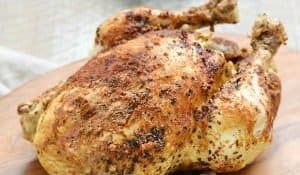 We are featuring this recipe! Hope to see you again this week. This looks like the perfect snack for me in the morning. They look small enough that I could pop a couple in my mouth throughout the day. Definitely need to try and make these…. Nice, simple and I always have puffed pastry on hand. These look great! I think I will add cheese and seal all the sides so it doesn’t seep out. I would love to add these to my line up for a house warming party but I need to make mot things ahead of time. Do you know if they freeze well?? Thank you! !